Mueller and Ketcham recommended a sequence of care that followed a simple order of A, B and C. A was for abstinence, which had to be total (“Alcohol is the primary enemy”). B was for body healing (where nutritional therapy could help heal the “ravaged organs” like the liver, stomach and brain). And C was for counseling (alcoholics needed help “putting their disordered lives together”). “Recovery from alcoholism must involve every aspect of the alcoholic’s mental and physical being,” they wrote, but, “like all chronic illnesses,” it could be treated with proper, holistic approaches that repaired broken bodies as well as broken souls. Despite Milam’s effusive praise, however, Mueller and Ketcham’s book was hardly the first on this subject. 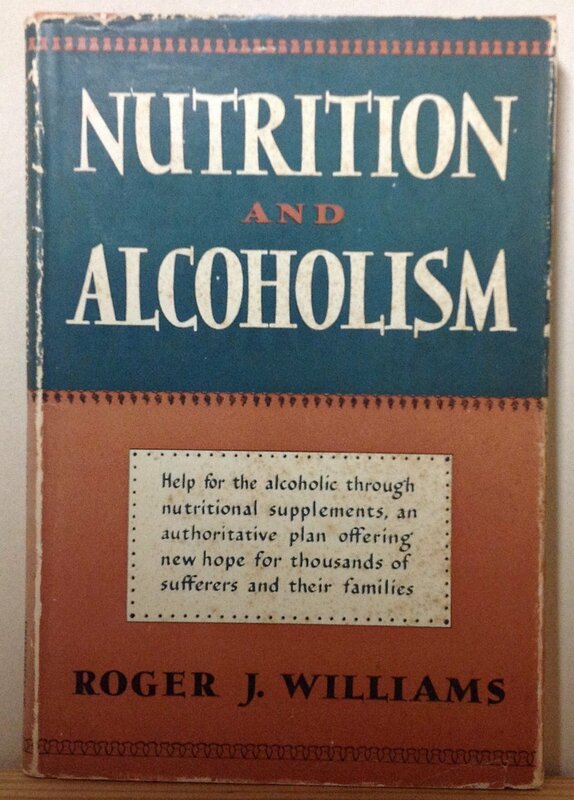 Dr. Roger J. Williams, the biochemist responsible for naming folic acid, was an enormous proponent of using nutrition to diminish alcoholics’ desire to drink. His first book on the topic, Nutrition and Alcoholism, was published in 1951, thirty-two years before Eating Right to Live Sober. In it, Williams suggested that the amino acid L-Glutamine (which naturally occurs in the body and is found in protein-rich foods like chicken, beef, fish and nuts) could help reduce an individual’s desire to drink. Alcohol inhibited the body’s natural production of L-Glutamine, Williams found, and reduced the body’s ability to absorb it from outside foods, so a diet rich in L-Glutamine supplements could help ease an alcoholic through the first days and weeks of sobriety. Williams went on to study the topic throughout his career, publishing Alcoholism: The Nutritional Approach in 1973 and The Prevention of Alcoholism Through Nutrition in 1981. But Williams also differed substantially from Mueller and Ketcham. Williams’s very 1950s recommendation for a diet rich in animal protein didn’t sit well with the authors of Eating Right, who quoted from Frances Moore Lappe’s Diet for a Small Planet and the meatless cookbook Laurel’s Kitchen, and encouraged readers to seek out complete proteins from bean and vegetable sources that were less taxing on the planet. Williams also believed that alcoholics who had their nutritional needs met could periodically drink socially without bingeing. This meant that his approach was at complete odds with the stance of Alcoholics Anonymous, which disavowed his first book, as well as with that of Mueller and Ketcham. For the authors of Eating Right, the alcoholic, especially the malnourished alcoholic, could never drink again: “Without abstinence from alcohol, all treatment methods are doomed to failure,” they warned. For Mueller and Ketcham, the point of nutritional therapy was to live as healthily (and as soberly) as possible, not to allow for the possibility of a regular glass of wine. The bulk of Eating Right to Live Sober is a surprisingly readable, scientifically-oriented account of the effects of alcoholism and hypoglycemia on the human body. It is illustrated with numerous case studies of people like “Al, a sixty-four year old Norwegian truck driver,” and Sandra, “who thought she might be going crazy,” as well as with actual illustrations (most notably of the organs involved in the processing of sugar and “variations in ‘normal’ human stomachs”). Its second half is an extensive look at a proper diet, focused on whole grains, fruits and vegetables, and it features over sixty recipes for things like “crunchy granola” and “Edie’s Broccoli Bisque” (“Company will be impressed!”). 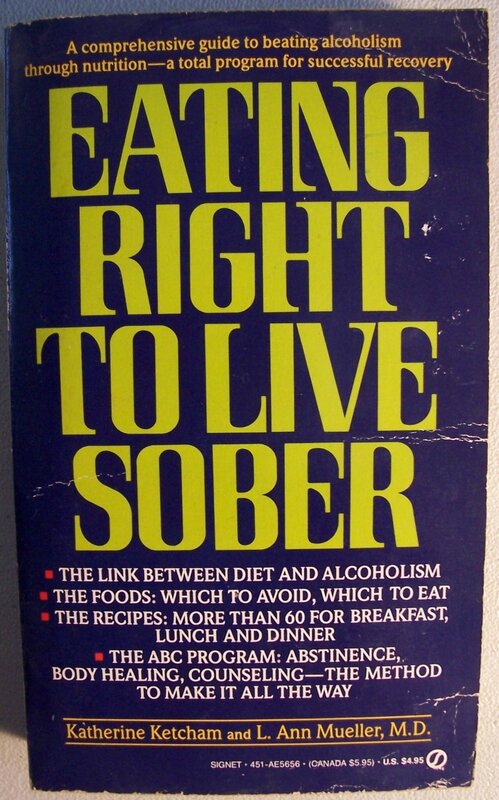 Not all of the nutritional advice in Eating Right to Live Sober would pass muster today. “Pineapple-Orange Gel” is listed under salads, and they recommend alcoholics make their own “butter-flavored margarine-like spread.” But much of the advice put forth by Mueller and Ketcham retains currency. Nutritional therapy is now in vogue – the Cancer Treatment Centers of America promote it as an integral part of their program – and these ideas, in various forms, have consistently been recycled everywhere from 1994’s Seven Weeks to Sobriety, to 2008’s Eating for Recovery, to 2011’s The Vitamin Cure for Alcoholism. Even Bill W., founder of Alcoholics Anonymous, saw connections between nutrition and alcohol addiction, and his personal physician, Dr. Abram Hoffer, advocated the use of the vitamin niacin to treat everything from alcoholism to depression to behavioral issues. As with all health advice, nutrition therapies come and go. But the history of the impact of nutrition on the treatment of alcoholism is lengthy and relatively unknown, and perhaps deserves a larger place in the literature. It’s an extremely useful lens through which to view shifting trends in American culture, since it speaks to larger ideas about food production, sustainability, and – most important of all – what Americans have wanted, and what we want to get out of, the food we eat. A fascinating topic! I’ve been looking into nutritional treatments for mental health disorders but I hadn’t heard of that approach with alcoholism. Food for thought here.